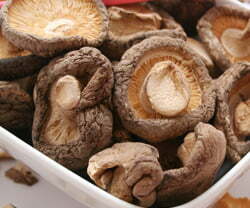 Shiitake is a kind of mushroom, very common in Asian cooking. Most chances you will to come across dried Shiitake as in the photo, rather than fresh. Dried Shiitake needs to be soaked in hot water for a few minutes, and then the stem should be removed. The stem is harder than the rest of the mushroom, and will not be as enjoyable. Shiitake has a very distinctive taste, it is not expensive, and is a blessed addition to any sushi roll – especially vegetarian. Where can I get Shiitake mushrooms? Shiitake mushrooms, as most sushi ingredients, can be purchased at Asian markets and food stores, or online. Below is a suggested link for purchasing via amazon. Great read! I would really to buy this Shiitake mushrooms. I can’t find the link to Amazon.